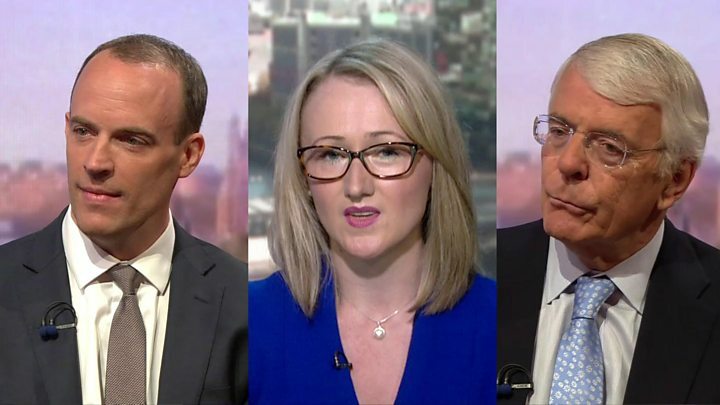 Media captionThree politicians give their view on a Brexit "no deal"
A deal with the EU can be reached by October but the UK is preparing for the possibility of no deal, Brexit Secretary Dominic Raab has said. He said he would return to Brussels for talks on Thursday and strain "every sinew" to get "the best deal". But the government had plans in place in case talks did not end well, he told the BBC. Labour leader Jeremy Corbyn said there must be a "serious stepping up of negotiations" to avoid no deal. Theresa May hopes the government's plan, detailed recently in the Brexit White Paper, will allow the two sides to reach a deal on relations by the autumn. Downing Street said on Sunday that cabinet ministers would be promoting the plan across Europe over the summer. Theresa May would "take the lead" by meeting the Austrian chancellor, Czech prime minister and Estonian prime minister next week. Mrs May said: "We must step up the pace of negotiations and get on to deliver a good deal that will bring greater prosperity and security to both British and European citizens. "We both know the clock is ticking - let's get on with it." Mr Raab told the BBC's Andrew Marr Show if the "energy, ambition and pragmatism" the UK brought to negotiations was reciprocated, a deal would be done in October. He noted that 80% of the withdrawal agreement was already settled. And he said it was "useful" that EU chief Brexit negotiator Michel Barnier had raised questions about the prime minister's blueprint for the UK's future trading relationship with the EU. "The fact Michel Barnier is not blowing it out of the water but asking questions is a good, positive sign - that's what we negotiate on." What would a 'no deal' Brexit look like? What does UK White Paper reveal? But he said preparations such as hiring extra border staff were being made because "any responsible government" would make sure plans were in place in case negotiations failed. Technical notices would be released for businesses and citizens affected during the summer to be "very clear about what they should do and what we are doing on their behalf" he added. Asked about European Commission comments that there were no arrangements in place for UK and EU expats in the event of no deal, Mr Raab said: "Well, I think that's a rather irresponsible thing to be coming from the other side. We've heard it often enough: "No deal is better than a bad deal". But for EU negotiators to believe the UK would walk away without agreement, the government has to be seen to be taking that option seriously. And so we are told about "planning" and "technical notices" to prepare for a "clean break" Brexit. Reports of food stockpiles and a motorway becoming a lorry park are dismissed as "unhelpful snippets" but contingency plans will be made nonetheless. Both sides agree a deal needs to be reached by October, and negotiations are likely to go down to the wire. So even if a deal appears to be in sight, expect the talk of the UK leaving the EU without one to continue. He added that the prospect of people being removed from the UK was "far-fetched and fanciful" and said it would be "frankly irrational" for the EU to go for the "worst case scenario" of no deal. But the UK had to be prepared with things like allocating money, preparing treaty relations, and hiring extra border staff "so that Britain can thrive, whatever happens," he said. Labour leader Mr Corbyn, on a visit to the annual Tolpuddle Martyrs Festival in Dorset, said it seemed the priority was preparation for no deal. He added that would be "very bad", as "we then go onto World Trade Organization tariff rates that would hit the manufacturing industry and hit the food processing industry, and hit an awful lot of things in Britain very rapidly". "There has to be a serious stepping-up of negotiations to reach an agreement on customs and on trade." Reality Check: What's the EU common rulebook? Earlier, Mr Raab suggested to the Sunday Telegraph that he was still persuading other cabinet ministers that the government's "pragmatic" strategy for leaving the EU was the "best plan" and that the UK could refuse to pay its so-called divorce bill, a payment from the UK to the EU estimated to be about £39bn, if it does not get a trade deal. Theresa May's proposal for a future trade relationship with the EU sparked two cabinet resignations, including Mr Raab's predecessor David Davis. The White Paper proposes close ties in some areas, such as the trade in goods, but will end free movement and the jurisdiction of the European Court, and allow the UK to strike trade deals with other nations. Critics at Westminster say it is an unworkable compromise which would leave the UK being governed by the EU in many areas, but with no say in its rules. And EU chief negotiator Michel Barnier questioned on Friday whether UK plans for a common rulebook for goods and agri-foods were practical and said the EU would not run the risk of weakening its single market. Meanwhile, Mr Davis, whose resignation from Mrs May's top team was followed by that of former Foreign Secretary Boris Johnson, told the Sunday Express the government should "start again" on withdrawal plans. Brexit: What does the government White Paper reveal?